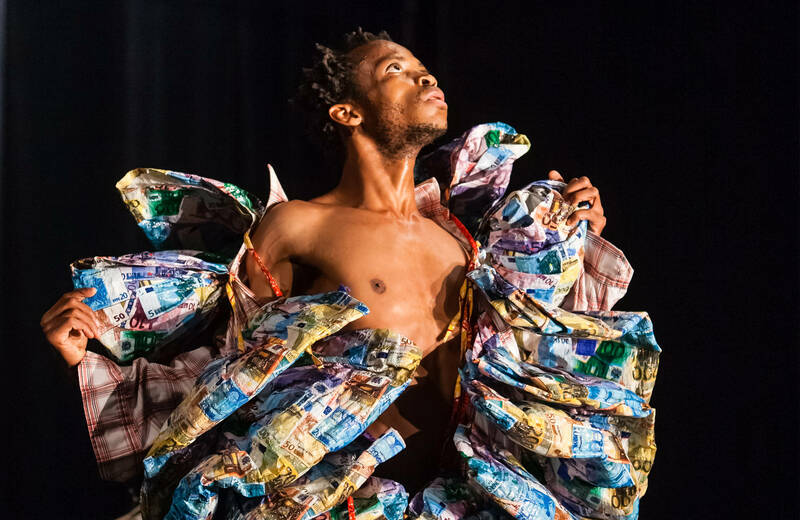 The work of Congolees choreographer Faustin Linyekula raises questions about the post-colonial condition and the violence done to ethics. Spare yet rich, simple yet complex, physical yet philosophical, his pieces mix global influences and ironic local detail. In his hands, dance is a tool which is used to collect testimonies and to engage with the outcome of these testimonies. Linyekula was born in the Democratic Republic of Congo, but moves to Kenia when local opportunities are blocked by government closure of universities. Here, he starts following theatre and dance workshops. In 1993, he co-founds Kenya’s first contemporary dance group. Despite his burgeoning international reputation, in 2001 Linyekula returns to Congo where he sets up a teaching studio, ‘Kabako Studios’, and creates a ‘homecoming’ work entitled Spectacularly Empty, which explores the chaos of memory and realities of return. In 2007,Faustin Linyekula is honoured with the Principal Prince Claus Award for his outstanding choreography, for his bold return to the turbulent context of the Congo, for his innovative activation of culture in the face of conflict, and for his energetic commitment to the development of his community.